In 2013 Wessex Archaeology undertook a programme of historical building recording and evaluation work at the Square Chapel, as part of the Cornerstone Project which is adding an extension to the Arts Centre and alterations to Piece Hall. The evaluation confirmed the existence of in situ burials on all sides of the chapel and identified a minimum of 41 graves, this includes four brick vaults and eight articulated burials. 19th-century structures associated with an extension to the chapel were also recorded. The name plate of James Thompson provided a burial date of 1831 for a grave on the eastern side of the chapel, extending the known period of burials in this area. In 2015 we returned to site to carry out a strip map and record excavation in advance of groundworks for the new extension. The work revealed over 100 skeletons in 65 graves and the footprint of the 19th century Sunday School. This was our first project working with Associate Consultant Angela Boyle. Angela is a specialist on post-medieval cemetery excavation and has worked as a professional archaeologist and osteologist for more than 25 years across the UK. Working with Wessex Archaeology’s Burial and Church Archaeology team, Angela is analysing the skeletons of over 100 Non-Conformists buried at the Square Chapel, Halifax in the 19th century. The western limits of the Square Chapel churchyard were excavated by Wessex Archaeology in the autumn of 2015, in advance of the Cornerstone Project, the refurbishment and extension of the Square Chapel Arts Centre. Angela’s analysis is in the early stages but has already revealed interesting information about the health of the people buried in the churchyard. Skeleton 1232 was an adult male aged between 36 and 45 years when he died. He had some evidence of moderate spinal degeneration in his neck and lower back along with clear signs of osteoarthritis in his left hand. This man also had poor dental health. One of his upper premolars has decayed to the extent that only the root of the tooth survived. This would have caused him a lot of discomfort. The small circular perforation visible on the bone is evidence of a dental abscess and there are signs that the bone was infected. Quite a lot of calculus (calcified dental plaque) is present on the molar teeth. This is further evidence of poor dental hygiene. The third molar, or wisdom tooth, also has a large cavity. Skeleton 1314 was an elderly woman who was at least 60 years of age when she died. There is evidence to suggest that she was suffering from osteoporosis, a condition still common among elderly women nowadays. The condition decreases the density of the bones, making them fragile and much more likely to break. Fractures of the wrist, hip and vertebrae are commonly associated. Unfortunately, this skeleton was poorly preserved and none of those bones survived. However, the bones of the arms and legs exhibit fine hairline fractures which are linked to this condition. Many of the skeletons have bones which are stained green in places. 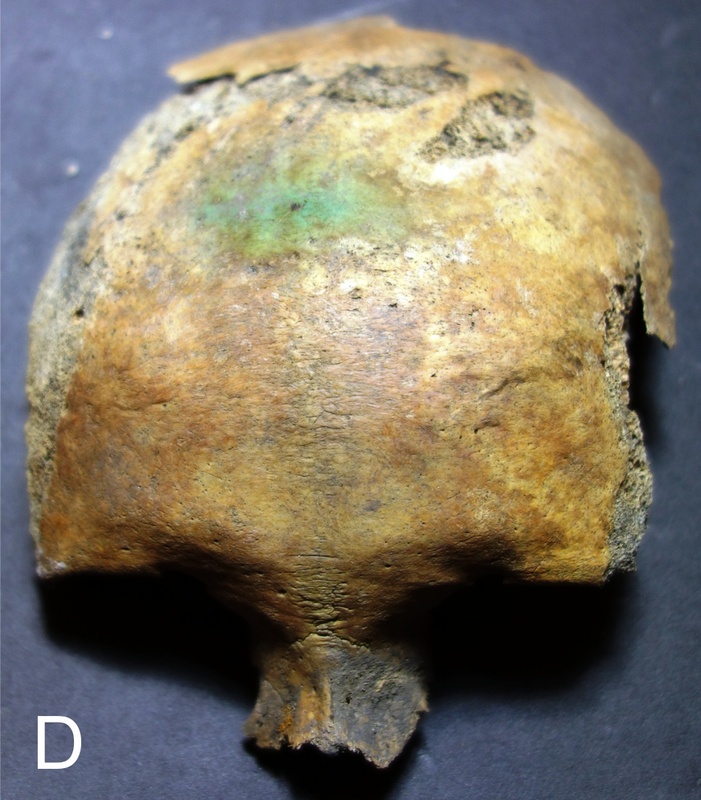 This would have been caused by brass coffin fittings which came into contact with the bones as the coffins decayed. In some cases the staining would probably have been caused by shroud pins. The work was carried out through Kier and Evans Vettori on behalf of the Square Chapel. The skeletal remains will be reinterred on site later this year after full osteological analysis. Angela will provide regular web updates as the work continues.